This lesson from Amy Kingsford first appeared as a part of the membership class “Canvas.” For that class and over 60 more, join us. 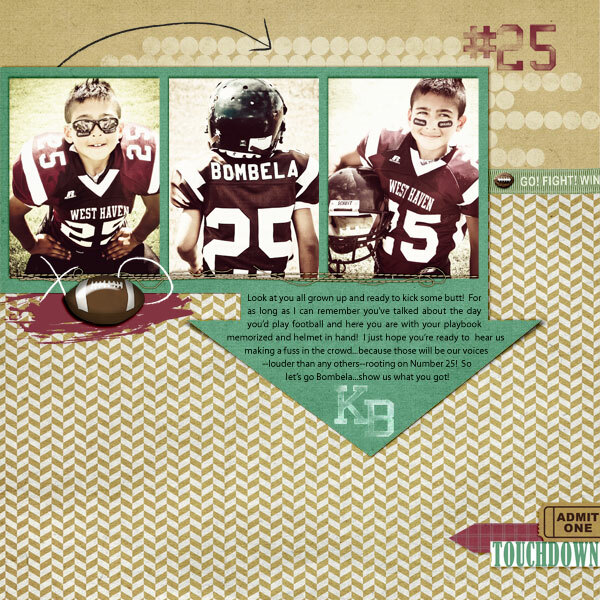 There are several ways to convey emotions and establish meaning on your scrapbook pages. Some of us rely on our photos and words to shoulder this responsibility while others look to embellishments and patterned papers. I’d like to share yet another option for setting tone on your layouts. That option lies in those very first layers you put down on your page. I find this approach to be particularly helpful for my holiday and themed pages. Not only does this approach let me communicate emotion and meaning, it also sends me in new directions with my page designs. Build your foundation with a shape that reinforces the theme of your layout. The bold, graphic feel of my arrow-shaped foundation here supports the feeling of masculinity. I’m usually drawn to fancier and prettier designs more than the masculine, but because I started out with this chunky arrow, I went on a path to creating a page with clean lines, minimal embellishments, and an overall “guy” feeling. Try recreating the texture or movement of your subject for an interesting foundation that simulates the feeling and flow of your memories. Attempting to recreate the essence of your memories on the page offers an opportunity to have fun with the page’s foundation. Here, I’ve aimed to recreate both the the texture of the cloudy October sky, as well as the dancing movement of the autumn leaves with my page’s foundational layers. The blended background foundation tones down the patterned background and isolates the key elements. My freestyle stitching acts as a path for placing key elements and establishing page flow. As a result, this page has a strong sense of theme, yet the light and airy feeling that I was going for. After The Leaves Fall | Supplies: Boardwalk Kit by Studio Calico, Homestead Collection by SEI, Little Sprout Patterned Paper by Crate Paper, misc buttons, masking tape and steel wool. Create a scene that sets the tone for your page and welcomes your viewer into the memory. Creating a scene as the foundation for your layout is another great way to convey the emotion behind your page. This option invites your viewer into the page and helps them feel a part of the memories being recorded. On “Mantel Memories,” I set the scene by using a digital fireplace brush as the foundation. As with any great foundation, once I had it set, everything else fell into place. I arranged my title on top of the mantel, and my focal block inside of the fireplace where the fire would go. The end result is a perfect little scene where my memories feel right at home! Mantel Memories | Supplies: Kitschy Christmas by Jenn Barrette & Sahlin Studios, Circa 1934 Papers by Cosmo Cricket, Stitched White Borders by Anna Aspnes, Ready Made Christmas Titles by StudioDD, Wooden Alphabet No. 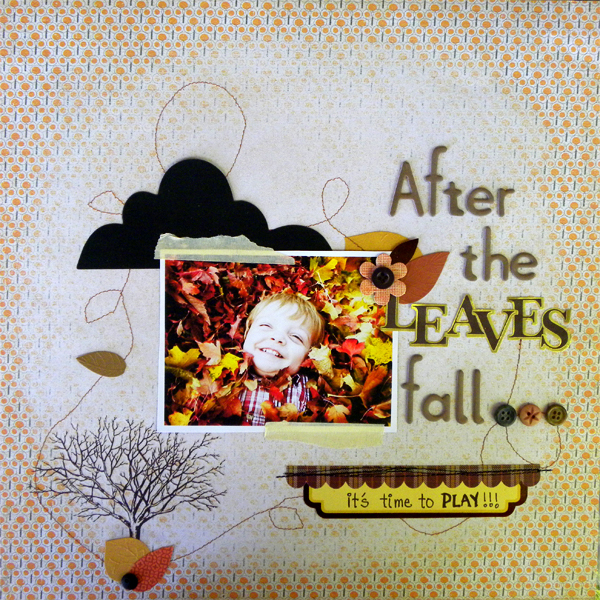 3 by Katie Pertiet, Krafty Cut Leaves No. 1 by Katie Pertiet, Holiday Brushset at Brusheezy and Glitter Dust by Froot Loop Sally. Fonts: Alfredo Heavy Hollow and Miserably Lose. Now you give it a try, yourself. Start your next page with the goal of setting tone right out of the gate, and you’ll be pleased by where your page foundations will lead you!